Ever Heard of Jews in Mauritius? The Jews in Mauritius is a small and relatively young community. You see, our Island country is a nation of immigrants. The synergy of Western, African and Oriental way of life is very palpable here. Whether our ancestors came on their own free will as merchants or free workers; or through coercion as slaves and indentured labourers under French and British Rules respectively, an undeniable fact remains. Mauritius is a delicate blend of Indian, Chinese, African, French and British cultures and traditions. But have you heard of Jewish Faith in Mauritius? To many that would sound out of sync. Though Judaism is not deeply rooted here let me assure you that to date, a small community of less than 100 people does exist. They are not related to the group of Jews who were detained in Mauritius during the Second World War. During the late 1940 a group of Jews were denied entry to Haifa, British Palestine by the British government following drastic measures to avoid illegal immigration. Fleeing Nazis prosecution, they came from Poland, Germany, Czechoslovakia and Austria without entry permits. In December that same year, around 1600 of them were deported by the British Administration in Palestine to Mauritius which was then a colony of the British Empire after dropping Trinidad and Tobago as an option. Their fate was to be decided after World War II. When they arrived, the group was sent to the prison of Beau Bassin which was officially known as the Detainment Camp. Men were segregated from women and husbands separated from their wives. Though they were not ill-treated, all suffered from tropical diseases, shortage of food and inadequate clothing. Isia Birger was the only Jew residing in Mauritius at that time. He arrived here from Lithuania in 1937 and married a local Catholic woman. Mr Birger interceded in favour of the refugees and was the only liaison between the Jews in Mauritius and the South African Jewish Board of Deputies. Subsequently, various foreign Jewish organisations sent aid to the detainees. When the interactions ban between the sexes was lifted, families were re-united and 60 children were born in the camp. At the end of the war, the refugees were granted the choice of returning to their home countries or make aliyah – the immigration to Israel. Most of the incarcerated survivors of the Jewish Holocaust sailed to Eretz Israel, the Promised Land on 11 August 1945, except 127 of them who didn't survive the four and a half years-long exile. The dead were buried in a section of Saint Martin Cemetery which is located a short distance away from Beau Bassin's outskirt . 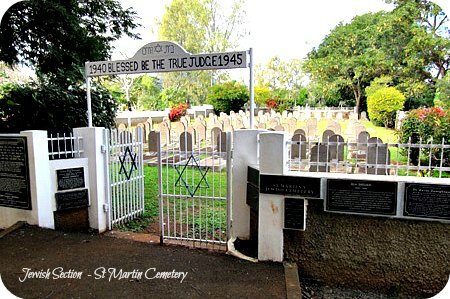 The burial ground was later handed over to the South African Jewish Board of Deputies by a Deed of Grant and which now maintains it. Kevin Harris, a South African independent filmmaker, produced a documentary entitled "In the Shadows of Beau Bassin" which narrates the saga of the deportation and detainment of Jewish refugees in Mauritius. The documentary was screened on SABC2’s Issues of Faith programme. You can watch an extract on YouTube. Officially, the Jewish Community of Mauritius was launched in May 2005 with the opening of the Amicale Maurice Israel Center in Curepipe. A small synagogue, which was consecrated by Rabbi Moshe Silberhaft in March 2011, is located at the center. Services are held once monthly and on Jewish holidays (Yom Tovs). The Jewish community of Mauritius is known under the appellation of Island Hebrew Congregation, pending authorisation from the Prime Minister's Office to be called the Mauritius Hebrew Congregation. Books about Jews in Mauritius. . . you'll really love! The Mauritian Shekel was originally written in French by Geneviève Pitot who was born in Mauritius, but later resided in Germany. Madam Anna Frank, a detainee at Beau Bassin Prison regularly visited a school to give art lessons. Geneviève, who was a teenager at that time, was one of her students. In the forward to the Mauritian Shekel she wrote “Fifty years later, by pure coincidence, I came across her pictures at an exhibition of the History of Jews in Berlin. This encounter made me conscious of memories that had been dormant within me. I had a strong desire to meet someone who had known Madame Frank and could tell me about her." Pitot met Madam Anna’s son, Vincent, in Germany and felt embarrassed when she realized she could not answer his questions about why the Jews were detained in the faraway island of Mauritius. Thus she started her punctilious research that led to the publishing of the book which not only shed light on a little known piece of Mauritius history, but also stands as homage to Madam Anna Frank. Geneviève Pitot was a structural engineer and she died in 2002. (Click on the image below to buy The Mauritian Shekel from Amazon). Rabbi Moshe Silberhaft is the spiritual leader of the African Jewish Congress and is affectionately known as the “Travelling Rabbi.” In his book he narrates fascinating stories about people he met while travelling across Africa. The Rabbi regularly visits the community of Jews in Mauritius. (Click on the image below to buy The Travelling Rabbi: My African Tribe from Amazon).